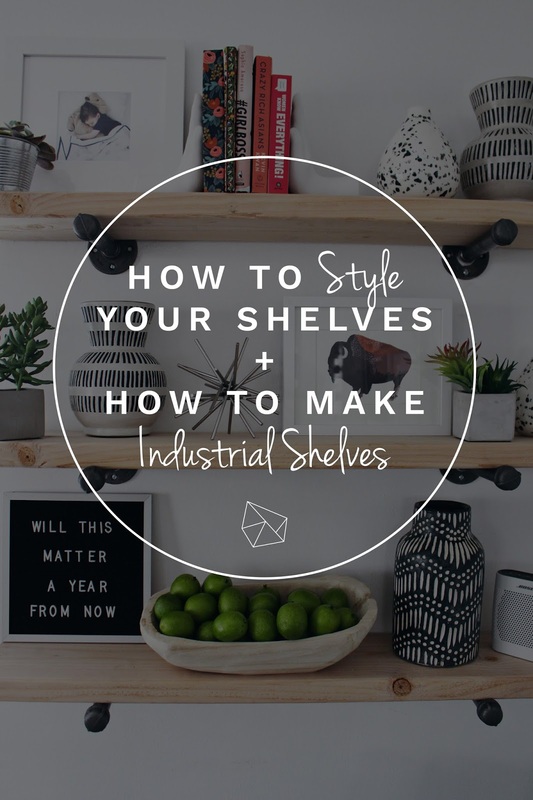 Ya'll asked how I styled our shelves, as well as where we got them from. 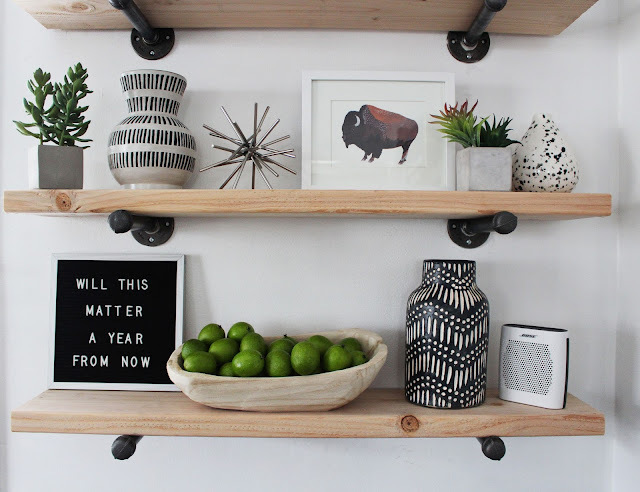 Fun fact, my husband made these shelves, and they're super easy to make. The materials cost us all of $40. 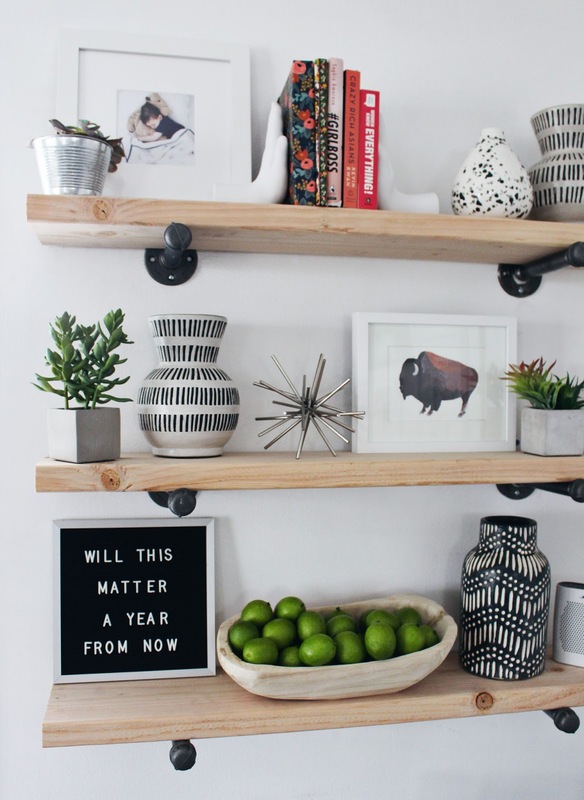 - Anchor the shelves to the wall (if you don't want to find your studs use this step) to make sure they wouldn't fall. - Put in anchors and screw iron flanges in. - Attach black iron pipes. - Put on end caps. 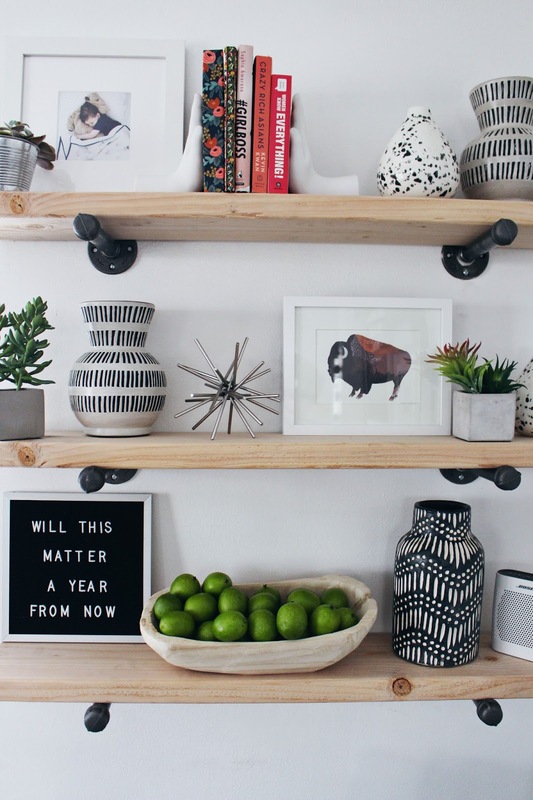 - Place wood on shelves. We didn't drill them to the pipes, or stain the wood. So it's super natural and raw, and easily changed out when and if we want. That's all it is folks! For just $40, you've got some amazing shelves. As far as decorating them, I found a majority of neutral pieces (black and white), and added a bit of green to them for color contrast. The shelves have both metal and wood, so I made sure to add bits of that into the decor as well, that way it flows from top to bottom. I loved the tribal print on the vases mixed with the speckled ones because they contrast each other nicely, while also still matching with the color scheme. - Try a mockup of what they'll look like at the store. Going to stores like Target, where they already have collections stacked together, is super helpful. You can see what matches, and it makes it a lot easier. - Try and pick things out that range in height. It creates more dimension. - Adding different textures like metal, wood, or even some kind of fabric (like a knitted basket) is always a good idea. Mixing texture adds depth and warmth. - Add things that have meaning, like a sign or a picture. 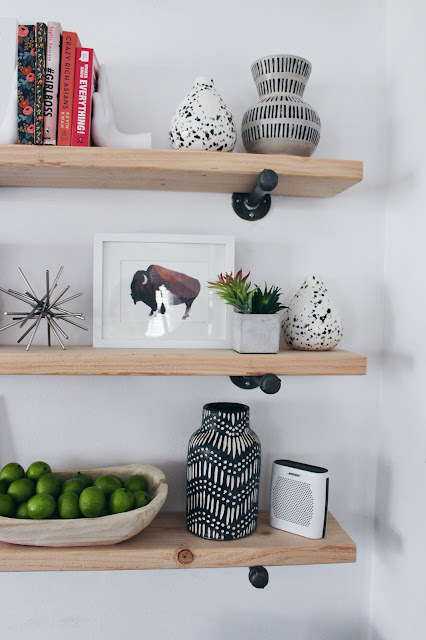 This might be a no brainer, but when doing this, make sure it is a piece that is also cohesive with the rest of what's your decorations. - Lastly, try and add some greenery to your shelves. It gives these industrial shelves some life, and with modern design and decor that's a must. Sometimes, modern can get cold, a bit of greenery warms it right up.